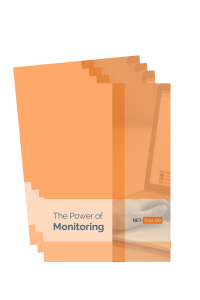 Find out why you should take monitoring seriously. Read our latest e-paper. What do your sales people, marketers, managers and other co-workers have in common? They all want to be able to communicate online and they want access to data. That requires insight into the performance of the network. The more complex the organization, however, the more difficult it is to maintain that insight. NetDialog makes monitoring – NPMD and APM – understandable for everyone. In this e-paper, we’ll explain what you can do with monitoring, provide you with comprehensive insights and hand you some valuable tips and tricks. I consent to have NetDialog collect my name, email and phone number.